Amazon.com Price: $279.13 $203.78 (as of 22/04/2019 10:20 PST- Details) & FREE Shipping. 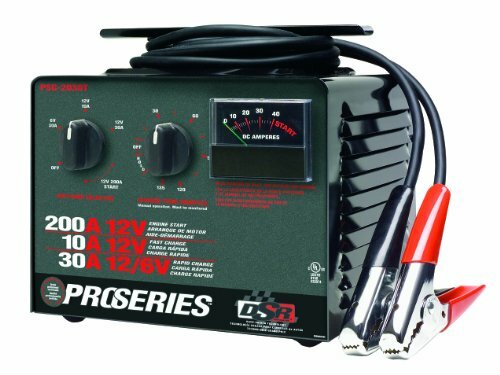 Schumacher’s PSC-2030T Manual Bench Top Battery Charger with Engine Start charges 6 and 12 Volt batteries, with 3 different amperages. The large face, clear-view ampere meter has an easy-to-read graduated scale. This Battery Charger comes with 600 ampere heavy duty, chrome plated Steel ultra-grip Clamp with plastic coated handles and heavy gauge spring for conductivity and long life. The 6-foot heavy duty, commercial gauge TPE welding grade cables allow for minimal current loss and flexibility in cold temperatures. The 9-foot AC line cord is great for accessibility and reach. This Battery Charger/Starter has a durable steel cabinet. 9-foot AC line cord for greater accessibility and reach. Item PSC-2030T is not available for sale in Oregon or California. The CEC compliant equivalent item is PSW-22, ASIN B005F1YM5I, so this item can be shipped to California.